My husband and I have been working on different projects with the same end goal. He is working on setting up our new site; Vintagethreads.com is still a work in process. 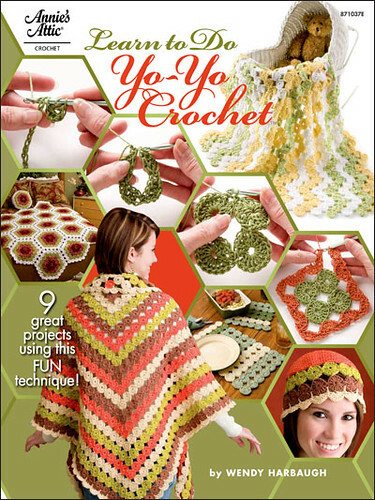 I have been making head wraps and yoyos for mini wall quilts that will be framed and for sale at the new store. 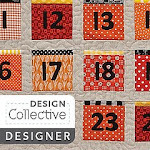 Yes, those vintage yoyos are scattered in with new yoyos to make these mini quilts so some of the fabrics are current, a few are up to 50 years old, and a touch are close to 100. 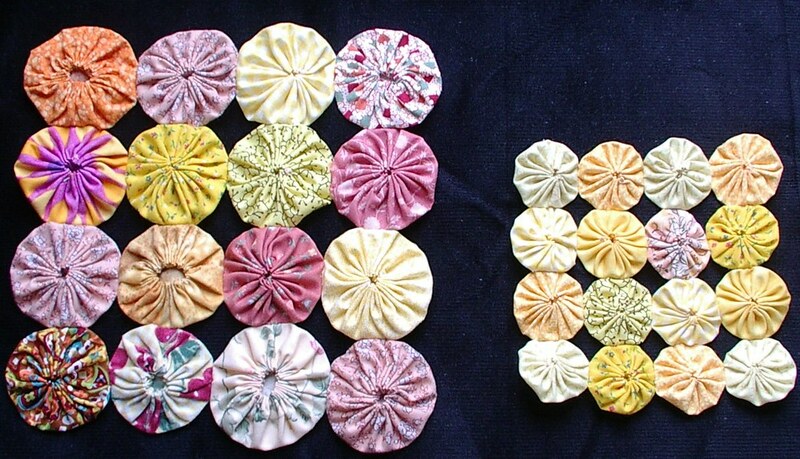 I doubt anyone besides me and the lady who gave the fabric to me will know which is which, but it is fun all the same to share vintage surprises. If you get a chance, check out the new site; it is still a work in progress so not much works there, but there is a poll. 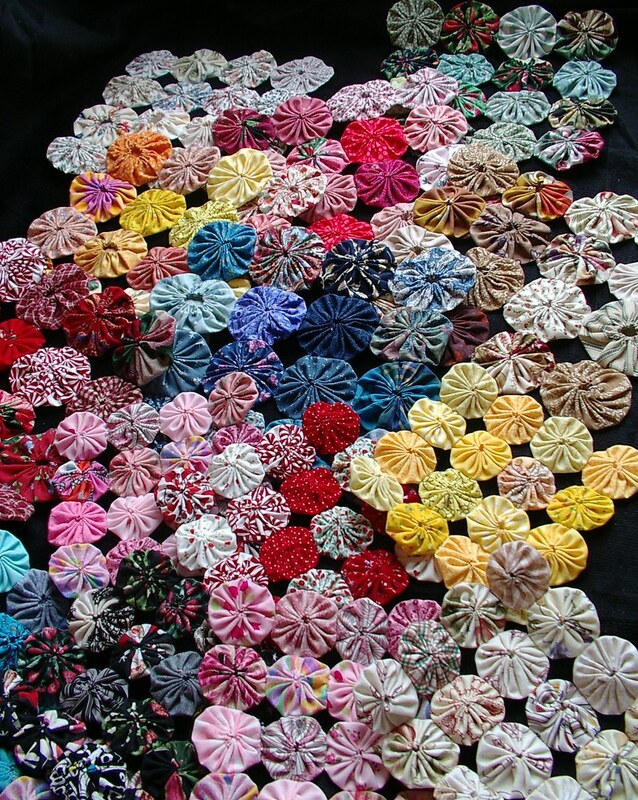 I would love to see what everyone's favorite fiber art form is. This may help decided what type of stuff is carried in the store that will be on this site in the coming weeks. If it feels like I have not been posting as much I haven't because I am working like crazy getting things made for the store opening. No! I am not getting a new heart, at least not in that way. I made a heart for Dana and it now resides with her and she has made one for me and it now lives with me, so our hearts have been transplanted into each other's homes, so to speak. 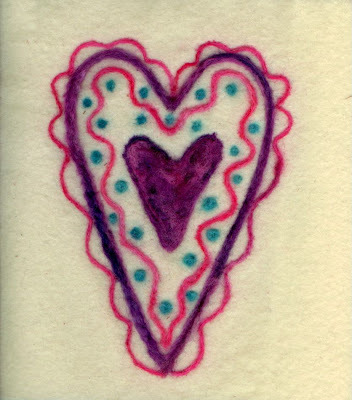 This heart is needle felted. I think it would make a lovely Valentine's picture or even the center of a seasonal pillow; not sure yet. I will have to think on that for a while. So are my plants. 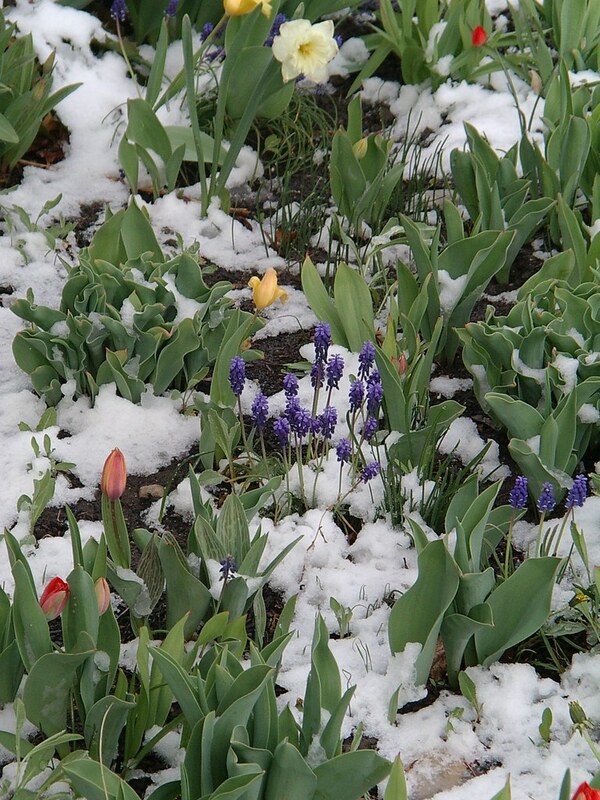 I actually woke up to more snow than this, but after taking kids to piano then school, I went to my mother-in-law's to drop off Easter stuff, the bank, the doctor, and the grocery store. By the time I got home the snow had melted mostly away. Wacky weather to say the least. My kids played outside two days ago and were asking when I was going to pull out the blow-up pool. They were having so much fun blowing bubbles and playing on skateboards and skates, you never would have anticipated snow today. Go figure!! I am in charge of a swap at MJF. When the items came in this time, I decided to take pictures of the big groups instead of waiting 'till after I sent everything back to everyone. This way you can see what everyone got, not just the items I kept myself. There are ten people in the group; each makes ten handmade items and sends them to me, then I sort them out and mail the boxes back to each person with 10 different items in them. First one to arrive was momof2jrt. She sent some cute bookmarks for every one to have; no two are exactly the same. The next package to arrive was from Suzyhomemaker. 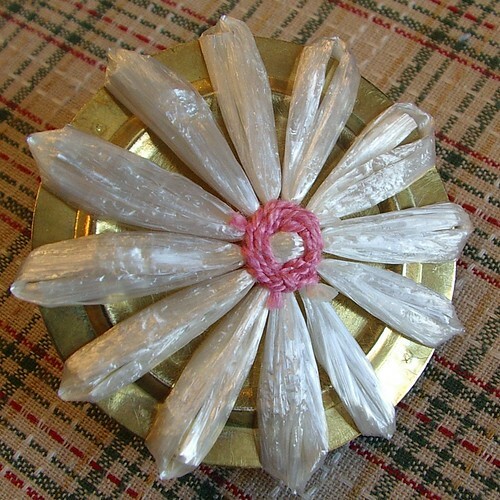 She sent handmade bags for everyone, with a bag of handmade bath salts in it. My house has smelled so nice I hated to see them all go to their homes. She also gave everyone sunflower seeds to start their spring flower beds. You also see a corsage made out of felt and a yo-yo that was a extra gift she sent as a thank you for me hosting; I love it. Kitchenwitch's box was the next to arrive. She thought hers didn't come out well. I think they are quiet lovely. I love all the soft colors. There are actually two images per egg. 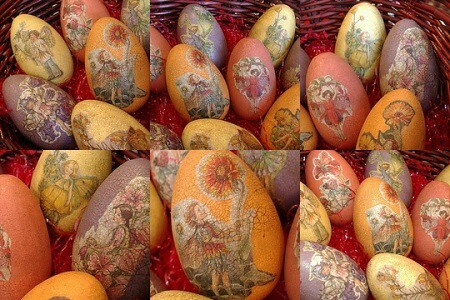 It is just impossible to show the front and back of the eggs at the same time. I wish I knew how she made these; I love flower fairies. It was a hard thing to give these up, but since there was only one that could me mine, I picked a purple one. Not an easy decision. At this point I lost track of the order the items came in so I will just post them. Ktknits sent two different items -- bugs and pillows. There are two types of bugs but each person gets one bug, so it will be a surprise which bug each person gets. 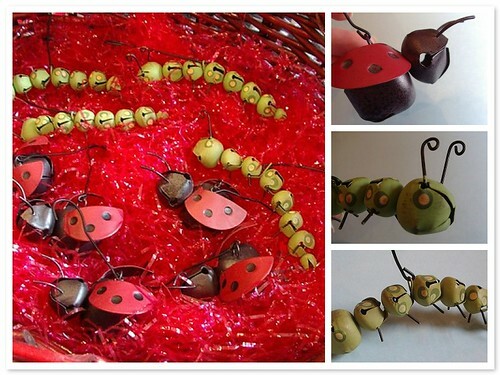 My kids just loved the ladybugs because they collect them, but we kept a caterpillar. For the farm girls involved, you may not recognize the yo-yos but I do; they are from another swap at MJF a while back I was in charge of that one too, every one sent in four different colored yo-yos to be traded with 12 other women (everyone made 48 yo-yos or something like that). So the yo-yos on these pillows represent a lot of farm girls not mentioned in this post. Willoetreecreek sent these sweet little Easter egg pins for everyone to wear. I think they are darling. 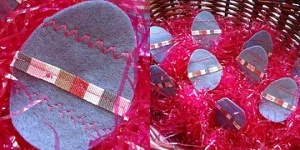 She machine stitched decorative details with pink thread and machine stitched on ribbon. She hand stitched a pin on the back of all of them. Leslie made doilies for everyone. 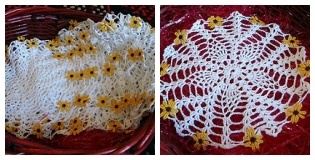 I think she crocheted them then added the daisies. They will be cute as a decorative accent at Easter time. It has been a real interesting swap; I think the variety of items in this swap is the greatest I have seen thus far. It never ceases to amaze me the different talents people have, especially when they say at the beginning of the swap they have none. 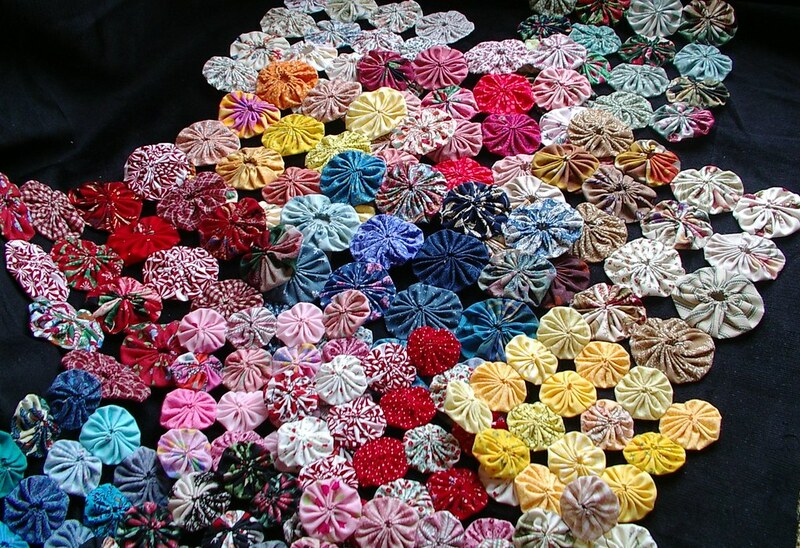 I made hair clips for everyone. Funny I don't even know if everyone has long hair; oh well, I have no problem if they give them away. 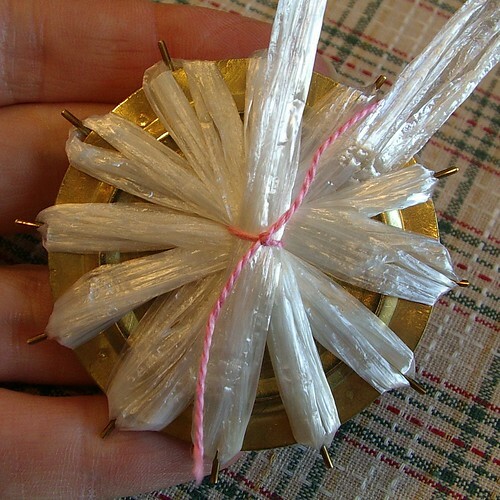 Some have crazy daises on them, others Easter egg yo-yos, and some plain yo-yos with buttons on a few too. 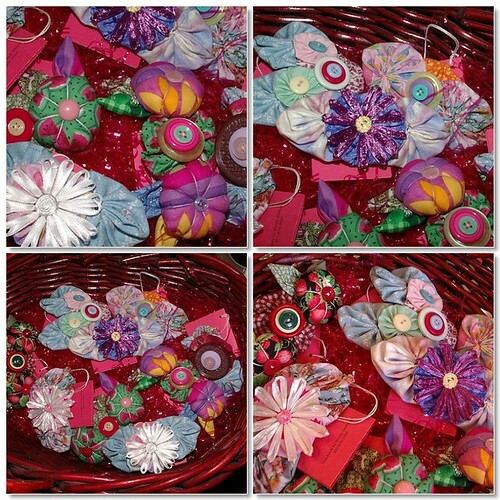 Shmeg made bath salts for everyone, and she also handmade stitch markers. Stitch markers are a knitter's thing. I think they came out real nice. I kept oriental-looking ones. My kids wanted to keep all of the item that Mommom sent. 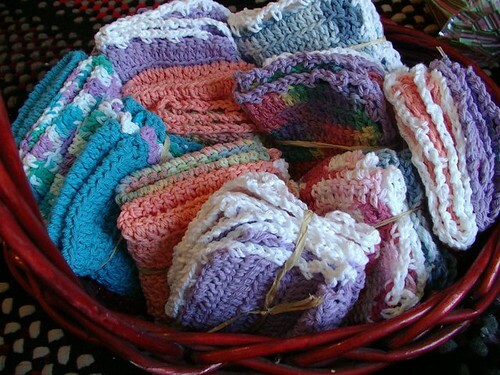 She made two hand crocheted dish/wash clothes for everyone. These are some of my kids favorite things for in the tub. You should have seen the disappointment on their faces. Mommom is so sweet she then sent each of them one, too. Excitement galore! 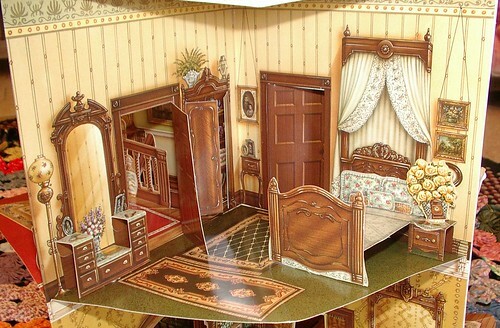 although I wish I owned a real Victorian home; but that is another story. When I was a child, my Vavo started me collecting paper dolls and porcelain dolls. I actually still collect both, just not as rapidly as I did as a child. That is probably because as a child I always got them at holidays and birthdays as gifts. I still love both but, because it started out as gifts I would receive from my grandmother, it has always seemed a little weird to me to go out and add to the collection. Although, every now and a gain, I do. 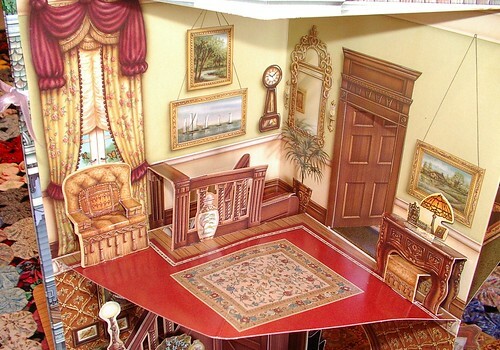 I remember one Christmas as a teenager my Vavo was given a paper doll pop up house as a gift. I was heart broken; I know, silly for a teenager to be sad about a paper doll. 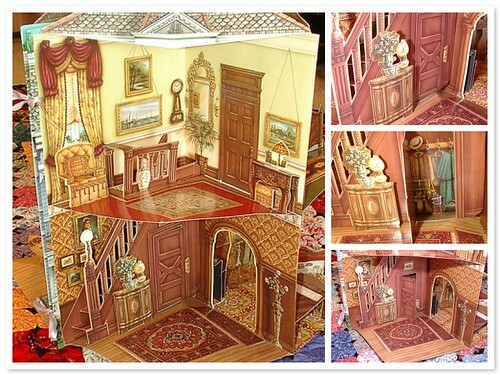 It was a really awesome paper doll pop up house. 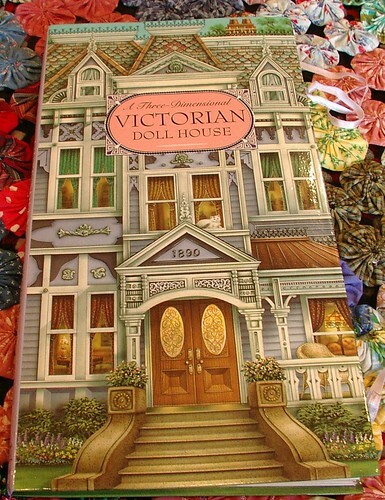 She knew I liked it and wanted to give it to me, we actually both love paper dolls and doll houses, but she couldn't because it was a gift to her and we didn't want to make the other family member sad or mad. 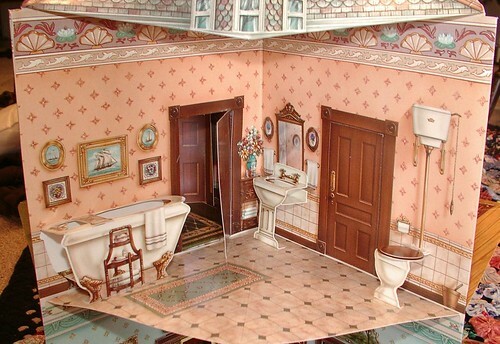 My grandmother didn't play with paper dolls and neither did I anymore; they were just things we liked looking at, with all that amazing detail that go into things such as these. This last Christmas, 2006, my Vavo surprised me. 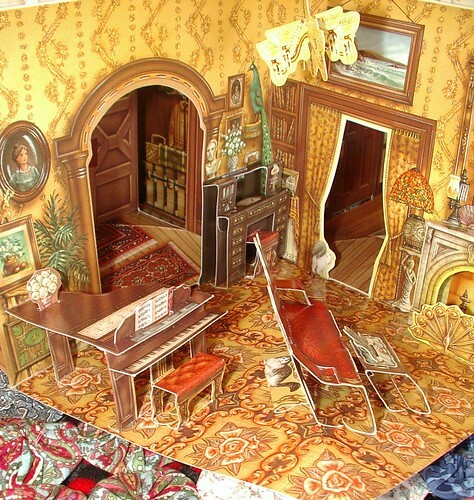 She had saved that doll house for 17 years and gave it to me. I was so excited, now my kids are the ones wondering why is mom getting paper dolls and not us. 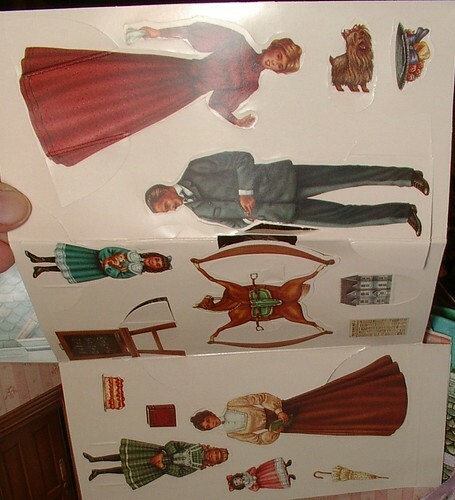 The previous year, 2005, I had searched all over the country to find the Mary Engelbreit magnet paper dolls, they had been discontinued for years already at that time. I found enough for each of my daughters to have one and each of my first cousins little girls to have one, and I also found 2 more for 3rd cousins plus a few for friends of my Vavo. I was sad because I could not find enough for me to keep one. She paid me for them and said thank you as she thought the little girls would have fun playing with them. She had a little surprise up her sleeve; my Vavo actually saved one and gave it to me this last Christmas, 2006. I have not received so many paper dolls at Christmas since I was a little girl. It was just great! 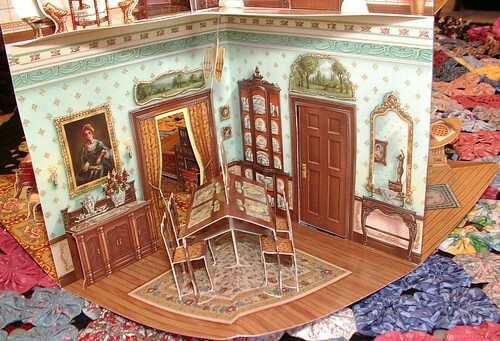 I thought the doll house was so great that I just had to show it for all those doll house and paper doll lovers out there. This has been in storage since 1989 when my Vavo received it. Everything is still there. You have to look closely to see the details -- the doors open on cupboards and pantries and things like that. I don't know about you, but when I was a child we hunted for tin eggs. I am not an old person (mid thirties) so this wasn't to terribly long ago. 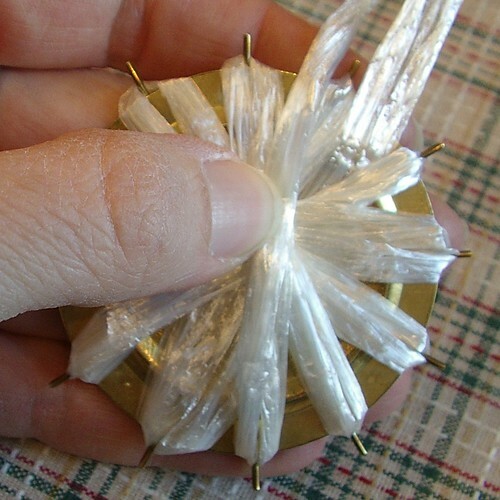 During the time it took me to go from being a child to having a child they seemed to have stopped making this type of Easter decoration and converted to plastic. I have been looking for tin eggs since 1998. I know that may seem silly, but they hold fond memories for me, and I have a hard time likening the plastic ones to Easter even though I own a ton of them. 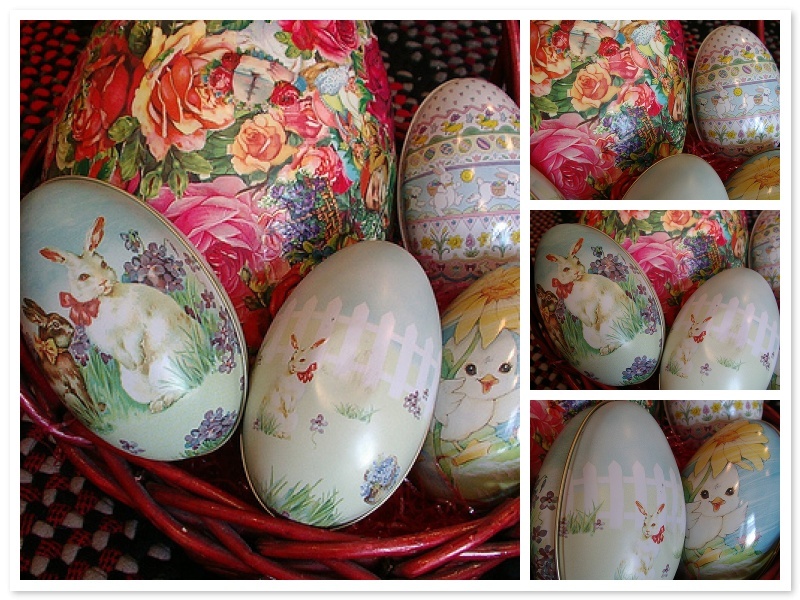 I have found all of these tin eggs at thrift stores. So here is my requests from anyone who reads this blog. If you know of places on the Internet to buy them, please let me know by leaving a comment to this post with the location on the Internet. Thank you. 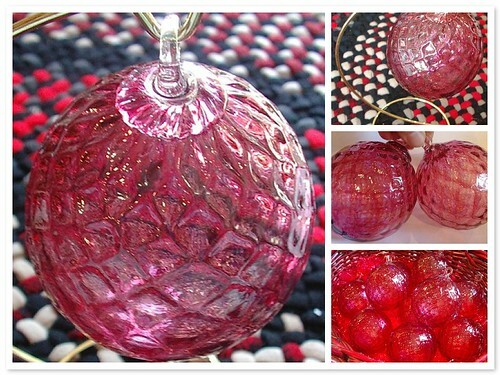 The other item pictured is a real large paper mache egg that I covered with antique scraps about eight years ago. I just thought it was neat and figured there had to be other people out there who like scraps, so I showed it. 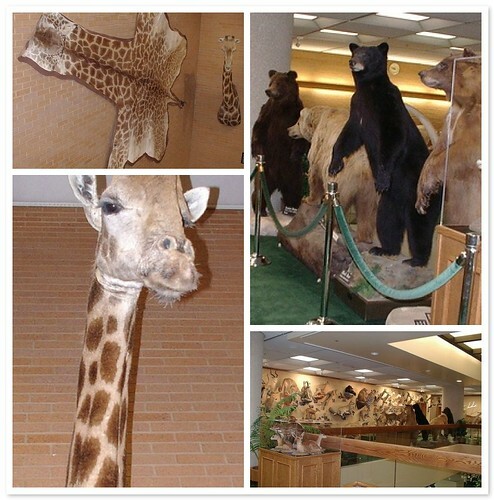 I have never been fond of animals that have been to a taxidermist. 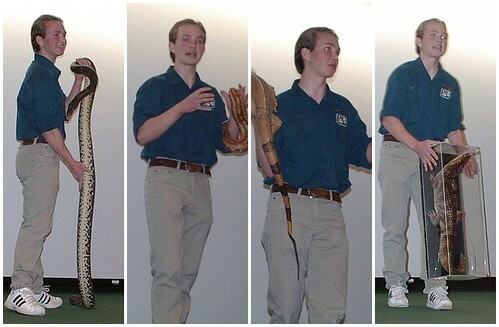 They are educational but creepy. I just love the color of this monitor lizard. 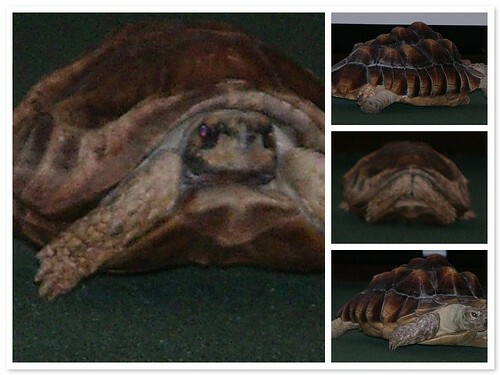 They had some tortoises there; this one was playing hide and seek a lot and had a thing for trying to eat white tennis shoes. 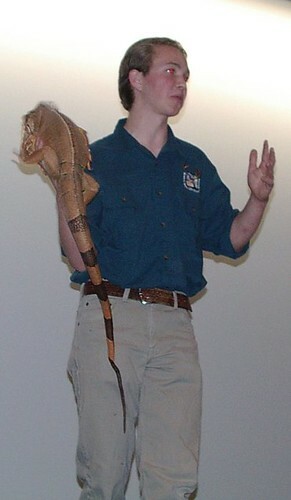 We saw a reptile show while we where at the museum, both a girl and a guy hosted the show. 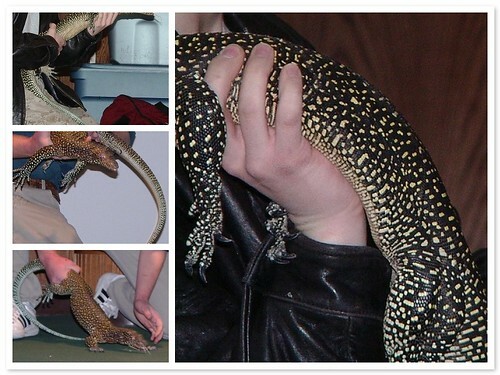 The guy was way more into reptiles than the girl was; half the animals, I think, were his own personal pets. 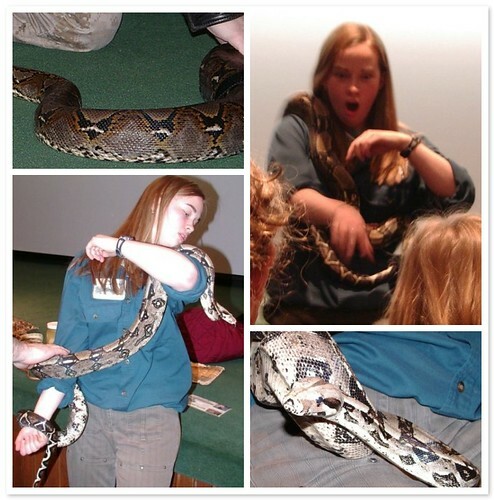 See, she doesn't look very happy and she was not happy with the reptiles the whole time, either; just not her thing. 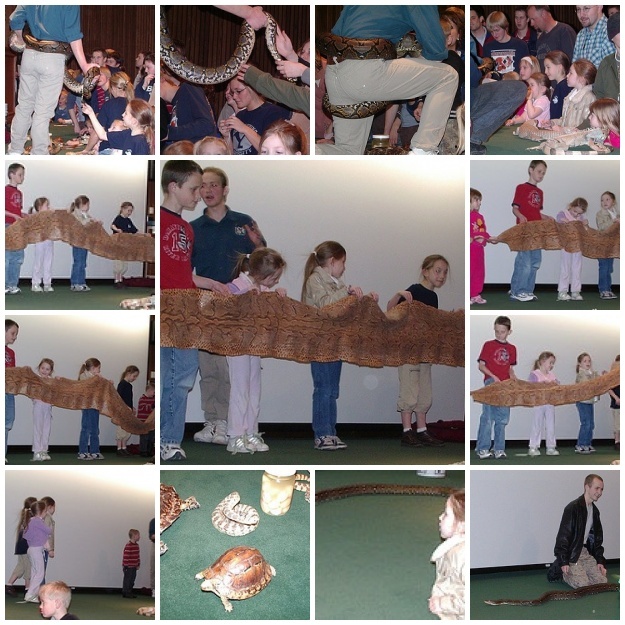 Really large snakes and other things! 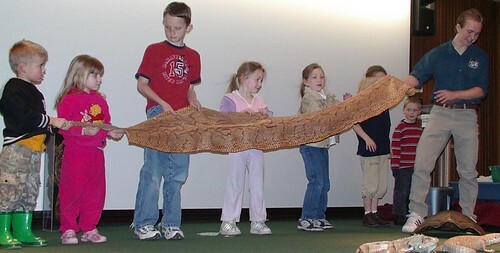 The girl in the bright pink is dinner size for the snake skin if it was still alive. A heart for Dana, originally uploaded by sunshine's creations. I was in a heart swap at Valentine's. After I posted my finished pieces on my blog, Dana said she wanted to trade for a heart. So this is the heart I made for her. I worked on this while taking care of my daughter at the hospital on and off these last few weeks. 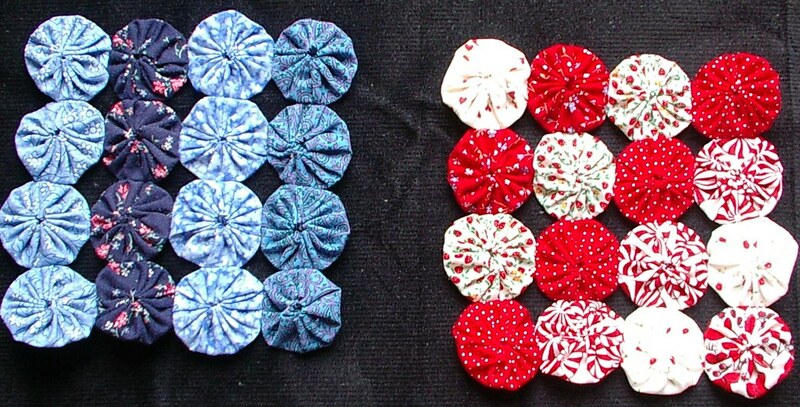 The fabrics are the same as the ones I used in my swag/garland at Christmas. Plus a strawberry one I received from my friend Berries at MJF. Some of the buttons are new; some are vintage. The pearl cotton bordering the heart is antique pearl cotton. This item is meant to be finished by the recipient. 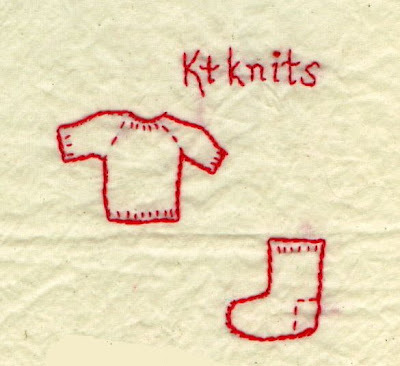 It can be added to in any way she wants, such as boarders to make it a little bigger to make a small pillow out of it; make it into an appliqué; or make it a pocket on an apron, you name it; what ever she can think off. I hope she likes it, too, because I did a different technique than I did before. 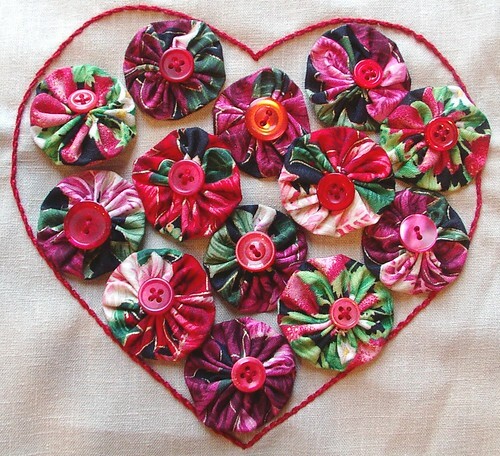 Some love and some worry for my daughter are in this heart -- every stitch. 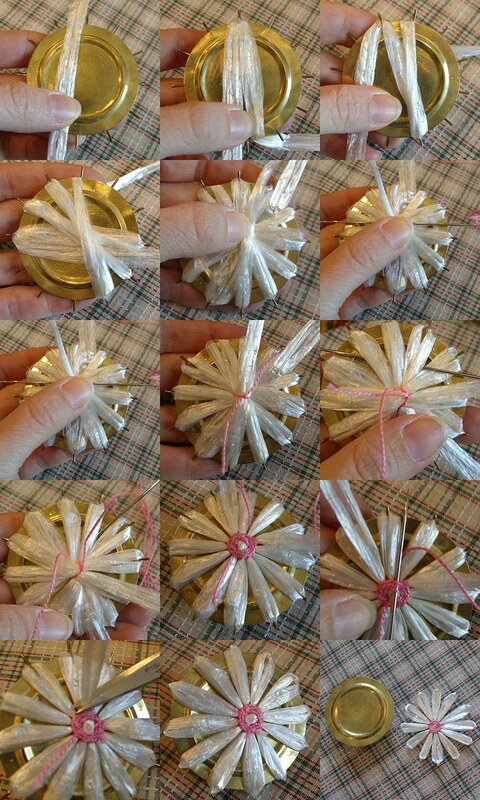 I decided to make a tutorial for those of you that might have this item from a thrift store but don't have the instructions. Lay straw across loom from bottom to top. 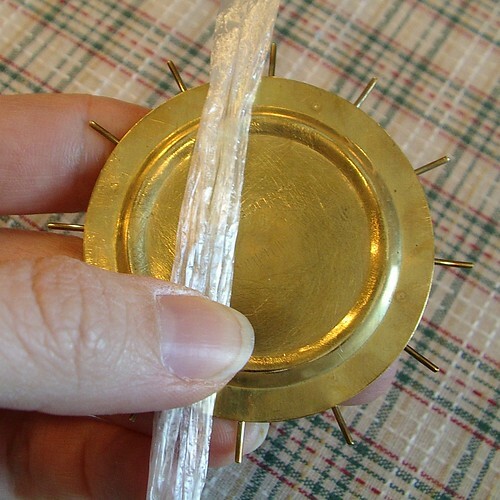 You can also use yarn or any other fabric type material that will bend nicely around spokes. Bring straw back to bottom of loom. Moving straw from left to right behind spoke. 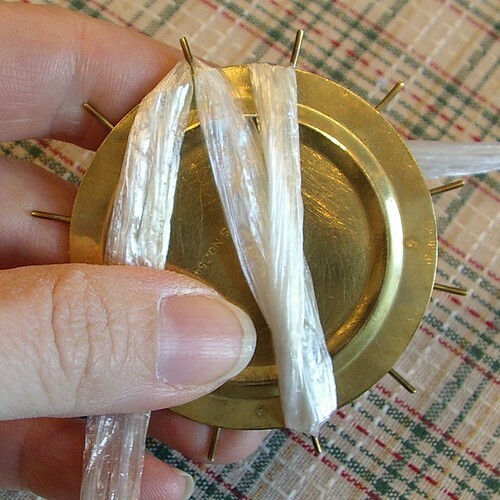 Then wrap the next spoke on the bottom left moving straw from right to left behind spoke. Moving to next spoke at the top right wrap straw around it and go back down to bottom. 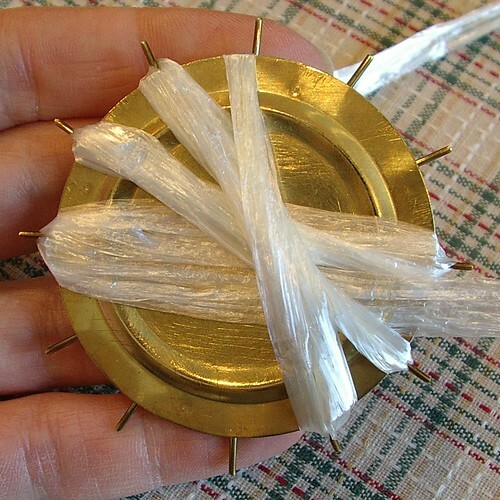 This time you wrap the spoke to the left of the last one you did on the bottom. 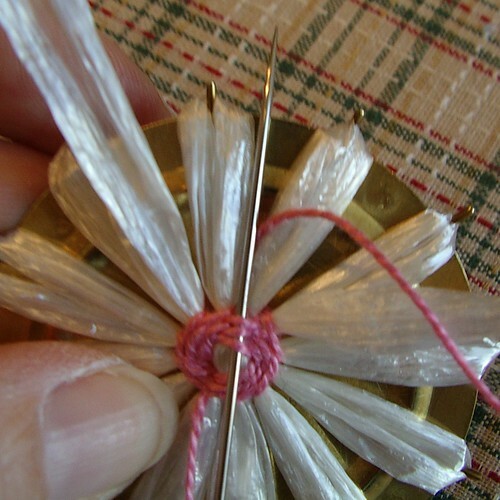 You will finish wrapping your straw to the left and on the opposite side of the loom from the first wrap. The two tails should be next to each other. 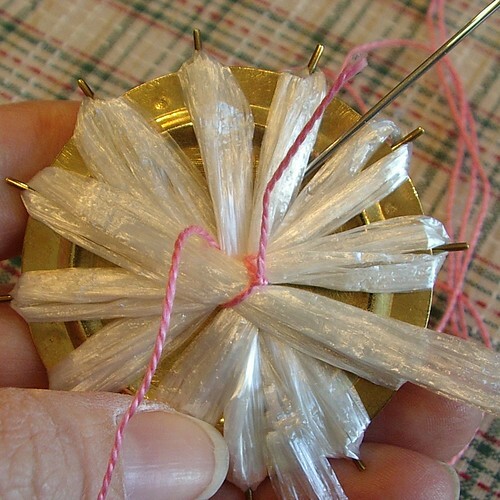 If you are using yarn or something like that you can go around the spokes 1 or two more times to have a petal with 24 or 36 petals instead of 12 like one row has. 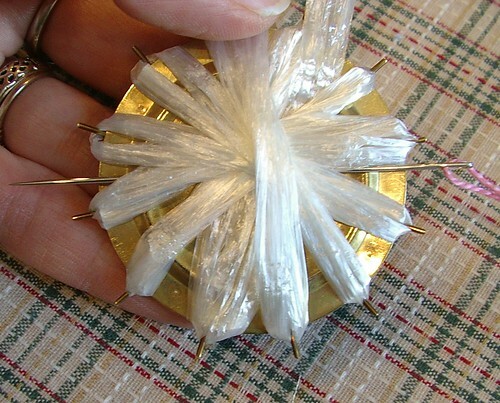 If you do this make sure to fluff flower at the end and separate the petals they tend to get stuck together. 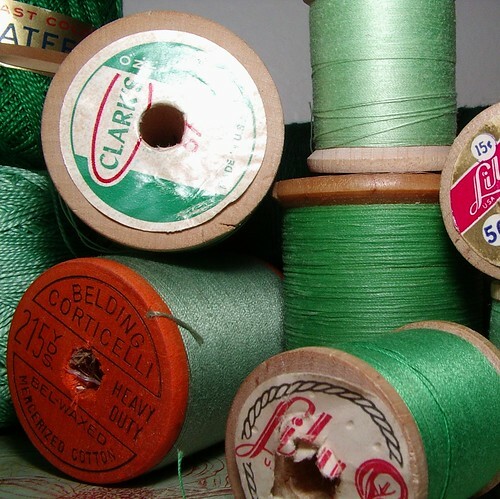 Have needle threaded with pearl cotton ahead of time and make sure your needle is longer than your loom is wide. 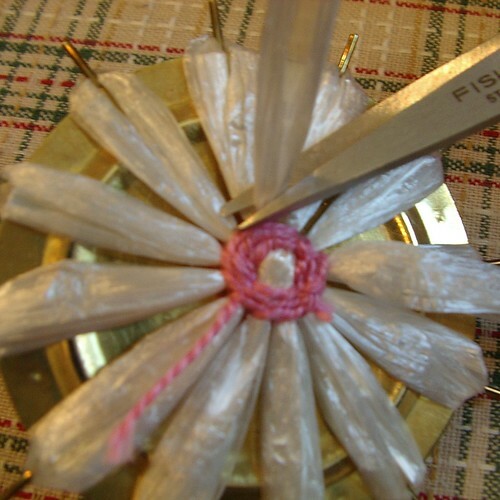 Pass needle under all the straw. Tie pearl cotton in knot. You are looking at the back of your work and are working from the back knots won't show on front when completed. 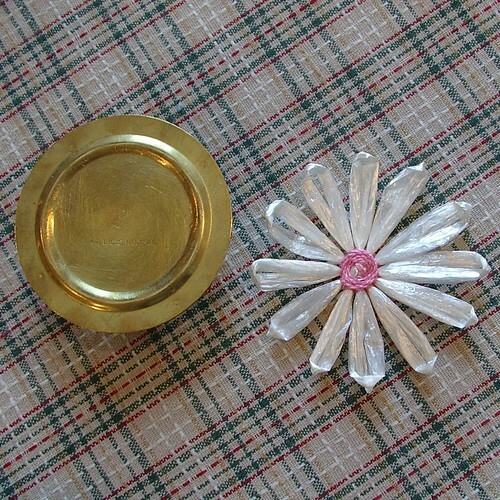 Pass needle from right to left under 3 petals of flower. Bring needle up and go back under last two petals and pick up one new one to the left of the last petal from the previous round. 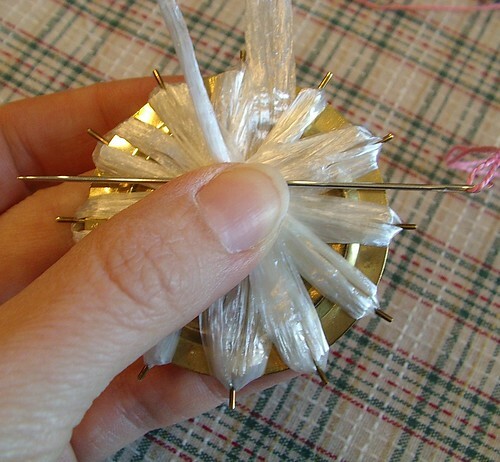 You will be rotating the flower in a clockwise direction with each pass of the needle. 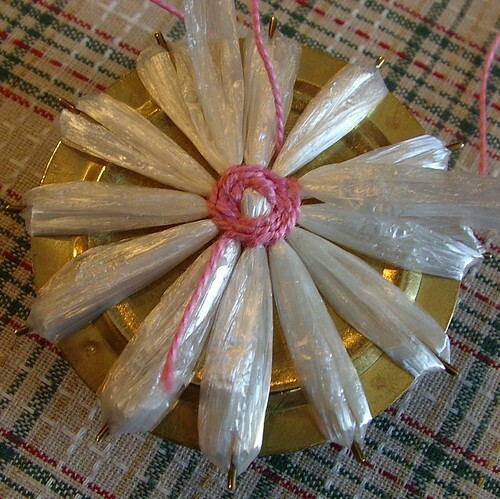 Continue this till you have 3 completed rounds of pearl cotton forming your center of your flowers and holding everything together . 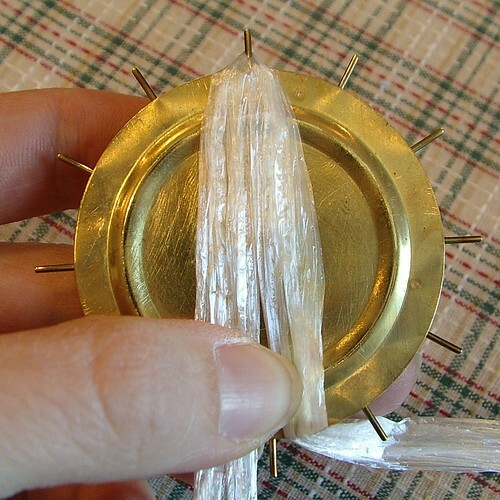 Finish thread by weaving it in and out of the pearl cotton do this about 5 times in different spots on the back. I like to do mine in the space between each set of petals and work my way around to each space. Cut straw and pearl cotton. You can make it more secure by using fray check or something like that. If using fray check let it dry. You can also do this step off the loom. 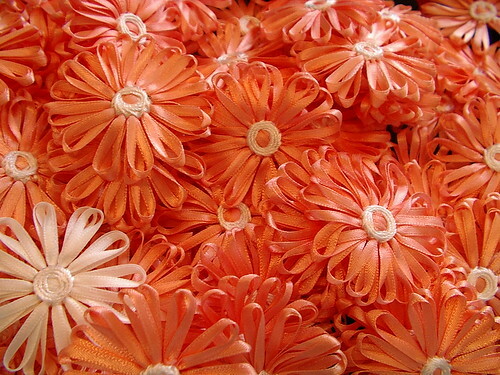 Remove from loom and sew onto desired item. See apron I made using these here. 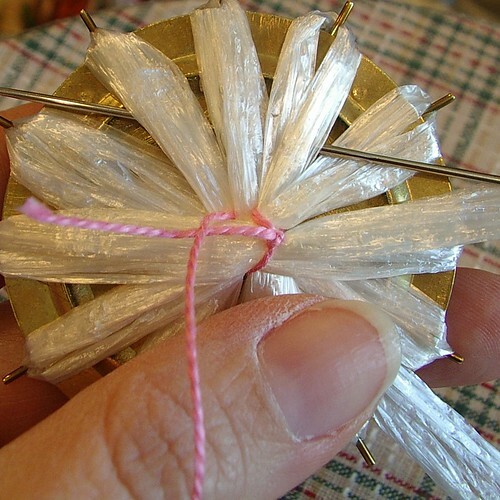 You can also see this same technique using double sided satin ribbon here. If you don't have this tool and you want to buy some flowers they are for sale at my store already made.